We have proposed a new support system that shows the internal state and future behavior of plant operations using an online process simulator. For improved simulation accuracy, we propose a tracking simulator that works simultaneously with actual process operations and automatically adjusts the simulation parameters. In this paper, we describe the application of the tracking simulator to an actual steam reforming process for fuel cells. We also present composition estimation and prediction as features of the operation support system. The process industry in Japan faces increasingly critical environmental and safety issues. Additionally, in Japan, many skilled engineers with years of experience will be retiring in 2007. Although the process industries such as petroleum, petrochemical, steel and paper, etc., are highly automated, human skill is still required in an abnormal situation or for a critical production change. Thus, new solutions are needed to overcome the above problems. Yokogawa provides both dynamic and static simulators for plant operations and offers integrated solutions mainly for petroleum and petrochemical plants. The opportunity of manual operations due to abnormal situation is reduced due to the increased stability and reliability of plants and their control systems. A training simulator for teaching operators how to handle start-up, shut-down, and other operations under abnormal situation has been developed and is widely used in process industries. These process simulators faithfully demonstrate actual plant behavior due to the accurate modeling of physical and chemical phenomena. Detection of abnormal state using the difference between measurement and simulation values, etc. However, to ensure that plant behavior is displayed exactly, the parameters of the simulator must be adjusted exactly. Thus, we propose a tracking simulator that works simultaneously with the plant and automatically adjusts the simulation parameters. In this paper, we describe the application of the tracking simulator to an experimental steam reforming process that generates hydrogen from methane for a fuel cell unit. To demonstrate the tracking simulator using an actual plant, we constructed the experimental plant of steam reforming process shown in Figure 1. This experimental plant converts methane in natural gas into hydrogen for a fuel cell unit. The process consists of 4 main parts: bubbler, reforming reactor, shift reactor and preferential oxidation (PROX) reactor. The bubbler is used for humidification of the feed gas, i.e. methane gas. Methane gas is mixed with water in this unit. Hydrogen (H2) is generated when the gas mixture passes through the catalyst bed in the reforming reactor, which is called the steam reforming reaction. Carbon monoxide (CO) is also generated as a by-product of this reaction. Then, the shift reactor generates H2and CO2 from residue CO and steam by the shift reaction. Finally, to eliminate residue CO, it is combusted with air (O2 ) in the 14 Yokogawa Technical Report English Edition, No. 43 (2007) PROX reactor. 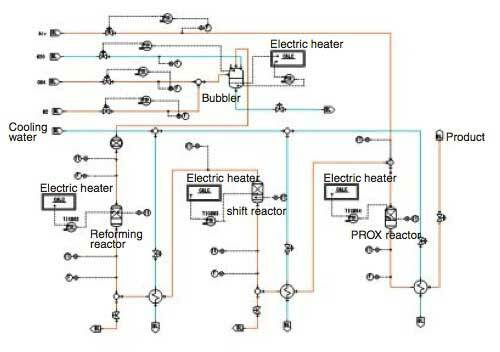 Electric heaters are mounted on all reactors and the bubbler, and they are controlled by adjusting the current. 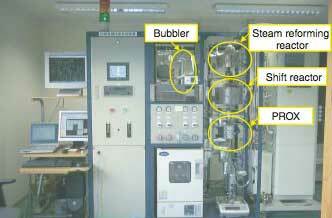 The experimental plant is equipped with the process control system STARDOM, developed by Yokogawa. Entire units including not only reactors but also valves, heat exchangers, etc., are modeled in our plant simulator. However, only the reactor model is discussed in this paper due to space limitations. Figure 2 shows an outline of the reactor model. In the model, mass balance and heat balance are calculated on each N partition divided along the flow direction. where r is reaction rate, xi is componential molar percent, P is total pressure, T is temperature, R is gas constant, Nc is number of components, k1 is frequency factor, k2 is activation energy, and Np, Nt, Ni are exponent coefficients of pressure, temperature, and concentration. where A is cross-section area, L is catalyst layer length along the flow direction, Siis stoichiometric coefficient, and x0i and xpi are feed and product composition of the i-th component. Next, at each partition in the catalyst layer, heat balance is calculated using reaction heat Q, heat transfer from the reactor wall q, inlet enthalpy h0 and outlet enthalpy h1. Therefore, the equation is expressed as equation (3). where ρ is density of the catalyst and Cp is specific heat of the catalyst. On the reactor wall, heat balance is calculated using heating from outside qx, heat emission qa and q in equation (4). where Tw and Ww are temperature and weight of each divided partition of the wall, and Cpw is specific heat of the wall. 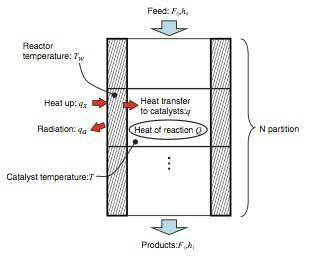 where Aw and Uw are heat transfer surface area and heat transfer coefficient between the reactor wall and the catalyst, Aa and Ua are heat transfer surface area and heat transfer coefficient between the reactor wall and outside air. As mentioned above, the other two reactors are modeled in the same manner as the steam reforming reactor. The entire process is modeled by constructing such a model for each piece of equipment. It is possible to construct an accurate plant simulator by using the process modeling technique based on physical and chemical laws. In this study, we use the OmegaLand, integrated environment for dynamic simulator based on physical and chemical engineering. In OmegaLand, the models for general equipment such as valves and heat exchangers are installed as a library of standard units. There is also a useful graphical modeling environment in which the process model is easily constructed simply by using the mouse to connect component units. To adjust the process simulator to an actual plant, it is necessary to set specific characteristics of the process as parameters of the process simulator. Rough parameter values can be obtained from handbook and design data, etc. beforehand, but for improved accuracy, the parameters should be individually adjusted using operation data. Moreover, to maintain high simulation accuracy, the parameters should be continuously adjusted using online plant data. As initial parameters are based on data from within a limited range of plant operation conditions, any change in operation conditions such as temperature, pressure, etc., must be reflected in the simulation. Therefore, the tracking simulator automatically adjusts the parameters to reduce the difference between actual plant measurement values and calculated simulation values. In this way, the simulator maintains a high level of accuracy and actual plant behavior can be traced by the tracking simulator. The unmeasurable internal state of the plant can be visualized using simulated data and the future behavior of the plant can be predicted by accelerating the simulator faster than the actual process. Then, the parameters that depend on the state of the process can be modeled after the operation under a wide range of conditions. In this study, the heat transfer coefficient was selected as one of the adjustment parameters of the tracking simulator. The heat transfer coefficient depends on flow rate of the fluid and the parameter obtained by analyzing the plant data under limited conditions must be adjusted when plant conditions change significantly. Moreover, the reaction rate constant that indicates catalyst performance is also assumed to be an adjustment parameter because it greatly influences the simulation accuracy and the catalyst performance can change dramatically according to the temperature. If the reaction rate can be estimated during operations, the simulation accuracy can be improved. It is possible to apply this by watching for a change in the reaction parameter according to the time to monitor performance degradation of the catalyst. Thus, as an example of operation support, the composition and temperature are estimated and visualized at the reactor in real time using the tracking simulator. In the reforming process, CO is generated as a reaction by- product. Because CO causes fuel cell performance degradation and deteriorates power generation performance, it is recommended that the concentration of CO contained in the reforming gas is below the level of ppm. If the CO composition is more than 2% at the outlet of the shift reactor, it is not possible to reduce it to below ppm level in the PROX reactor. Thus, the amount of CO generation is also important information for plant operation. Tracking simulation was applied to the reforming process, and the composition and temperature were estimated and visualized at the reactor with adjustments made to the parameters by the tracking simulator. The tracking simulator was executed simultaneously with the actual reforming process as shown in Figure 1. Figure 3 shows the model constructed on Visual Modeler. The model is composed of the gas feeds, bubbler, reactors, and heat exchanger. We operated the reforming process and ran the tracking simulator in parallel with the process. The reforming reactor's heater was operated manually, the CH4 feed flow rate and shift reactor's heater were controlled, and we changed the set values. The PROX reactor's heater was also controlled; however, we did not change the set value. The results of operation and the simulator results are shown in Figure 4. The upper graph shows the reactor outlet temperature of the actual plant and the simulator, the CH4 feed rate and the heater MV for the reforming reactor. The lower graph shows the transition of tracking parameters. The transition of operating conditions is listed in Table 1. First, at 30 minutes, the setpoint of the CH4 feed flow rate was changed from 600 to 1200 cc/min, the shift reactor's heater SV was changed from 250 to 300°C. 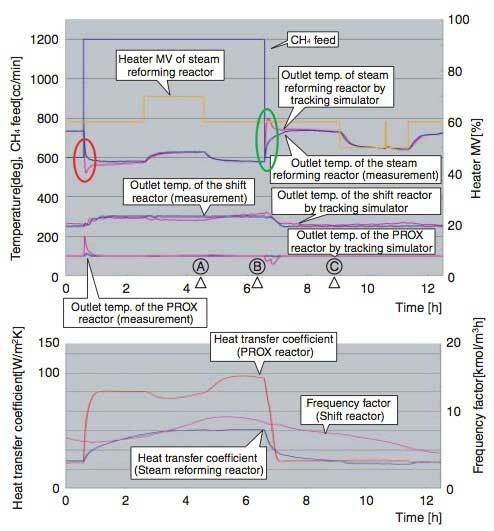 Immediately after the change in operating conditions, the simulated outlet temperature of the reforming reactor and PROX reactor moved dramatically compared to the actual process (see Figure 4, around 0.5 hours). This is because the heat transfer models do not take into account dependency on flow rate as described above. However, we confirmed that the simulated values gradually caught up with the measured values as a result of adjusting the heat transfer coefficients (the lower graph). On the other hand, inexact parameters were used in the reaction rate equation of the shift reactor. Due to this, there would be a difference between the simulated and measured outlet temperature. However, the simulated value tracked the actual value as seen in Figure 4. This is because the frequency factor continued to be adjusted throughout the experiment (the lower graph), and the reaction rate was calculated correctly as a result. Next, at 6 hours and 35 minutes, the CH4 feed flow rate was changed from 1200 to 600 cc/ min, and the temperature setpoint for the shift reactor's heater was changed from 300 to 50°C. At first, there was a simulation error in the reforming reactor and PROX reactor outlet temperature (see Figure 4, around the operating time). However, the error was gradually reduced due to adjustment of the heat transfer coefficients as well as the previous adjustment of the frequency factor. Also, we confirmed that the simulated values nearly corresponded to the measured values. As the results indicate, the tracking simulator can be adapted to various operation conditions by adjusting its parameters. This technique ensures that the simulator maintains a high level of accuracy to provide essential information about the plant. In the tracking simulation, composition is always calculated for the entire process. Table 2 shows simulated and measured composition at the shift reactor outlet at time points A, B, and C in Figure 4. The actual composition is measured by gas chromatograph. In this experiment, the frequency factor was adjusted not based on simulation error of composition but on simulation error of outlet temperature. However, the composition matched well with the actual data. Note that the tracking simulator always estimates the composition in real time whereas the gas chromatograph needs dozen of minutes for just one sampling and measurement cycle. There are constraints on carbon monoxide in the reforming process. The steam reforming process is expected to be connected to the fuel cell units. It is desirable that carbon monoxide, included in the product gas of the reforming process, be reduced to ppm level because it poisons fuel cell units. Reduction can be achieved by decreasing carbon monoxide to 2% at the outlet of the shift reactor. If it cannot be achieved, carbon monoxide is not reduced to ppm level in the PROX reactor. Operating under these constraints, our tracking simulator proves useful because operation can be verified through trial and error using simulation. In this paper, we described the modeling of a steam reforming process based on physical and chemical laws. Then, to maintain simulation accuracy, we proposed a tracking simulator that automatically adjusts the parameters of the model by using online process data. In the experiment, the tracking simulator was applied to an actual steam reforming process. Even if the model parameters were not considered depending on the process state, it was confirmed that the parameters were estimated by this technique. Moreover, we proposed an operation support system that visualizes an unmeasurable state and predicts the future response of the process. 'STARDOM' is a trademark of Yokogawa Electric Corporation. 'OmegaLand' is a trademark of Omega Simulation Corporation.